Horses can be large and majestic like draft horses or lean and showy like saddle horses. Hunter-type horses are built for speed and endurance, and stock horses are strong, ideal for working on the ranch. Ponies are small, but are strong enough to carry a young rider. Anatomical differences determine which category a breed of horse falls into. Stock horses are light, or hot-blooded, horses, meaning they weigh less than 1,500 pounds. Stock horse breeds are ideal for doing work on a ranch but are also used for riding as trail horses or for racing and agility contests. Stock horses are muscular, particularly in the shoulders and hindquarters. They have medium-length legs. Their heads are carried low, coming forward from the shoulder. 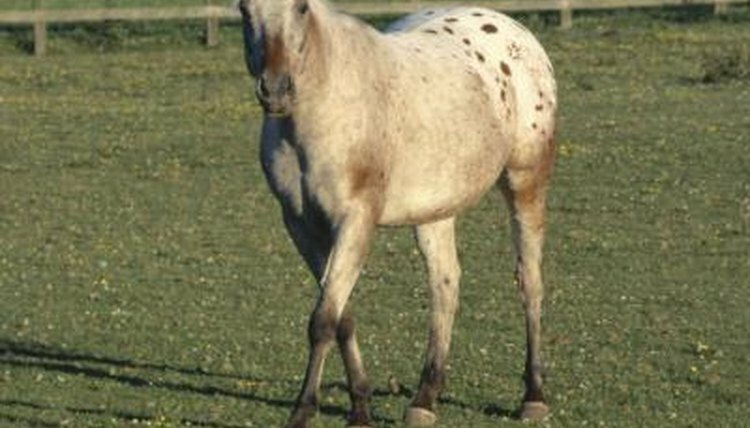 Breeds of stock horse include American quarter horses, Appaloosa and Paint horse. Hunter horses are also light horses. Hunter horses are athletic and sporty, perfect for traveling long distances, driving, racing and, yes, hunting. They have longer bodies that are less muscular than stock horses'. Hunter horses' necks are longer than stock horses' and they rise slightly more upward from the shoulder. Breeds of hunter horses include thoroughbred horses and Hanovians. Thoroughbreds are sometimes bred with other breeds, like quarter horses or Arabians, to encourage more athletic offspring. Saddle horses are light and lean, used primarily for showing and pleasure riding. They have long legs, lean bodies and long necks. Their heads are held high, coming straight up from their shoulders. Saddle horses lift their legs high when they walk. Breeds of saddle horses include American saddlebreds, Morgans and Arabians. Draft horses, also called cold-blooded horses, are large, weighing more than 1,500 pounds. Their sizes, strength and gentle demeanors make them ideal for hard farm work, like pulling plows. Draft horses are huge animals who can measure 6 to 7 feet tall at the withers. They have strong, well-developed muscles, heavy frames and short backs. Their necks are either straight or have a convex curve. In many breeds of draft horse, hair called feathering covers the hooves. Draft horse breeds include Clydesdale, Percheron, American Cream and Belgian. Ponies are short, compact horses who stand less than 4½ feet at the withers. They have muscular bodies and short legs. Stocky is an apt word to describe a pony; he has a broad back and a very round rib cage. Ponies also typically have thick manes and tails. Pony breeds include Shetland ponies and Welsh ponies.